This blog is about my continuing recovery from severe mental illness. I celebrate this recovery by continuing to write, by sharing my music and artwork and by exploring Buddhist ideas and concepts. 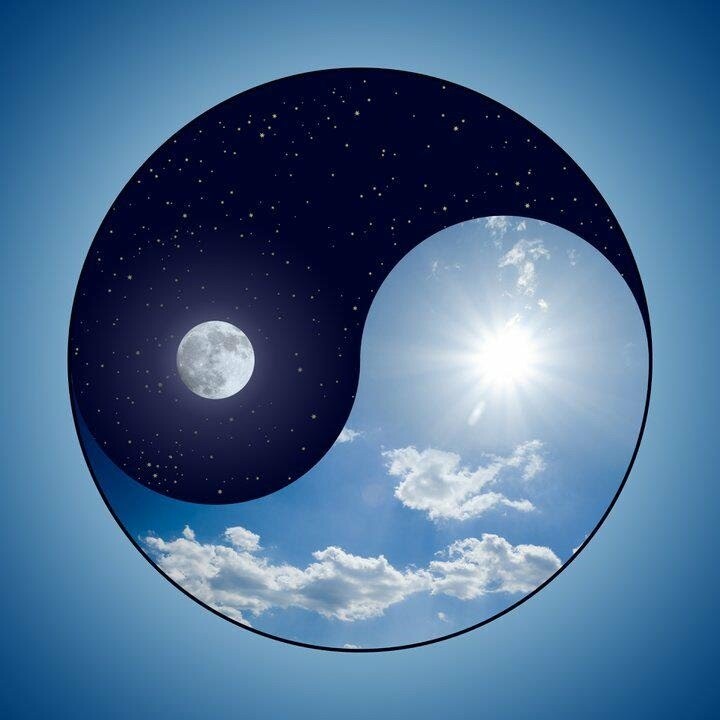 I claim that the yin/yang symbol is representative of all of us because I have found that even in the midst of acute psychosis there is still sense, method and even a kind of balance. We are more resilient than we think. We can cross beyond the edge of the sane world and return to tell the tale. A deeper kind of balance takes hold when we get honest, when we reach out for help, when we tell our stories. Karen, Chris, Juju and Jen, thank you for your comments! All of you amaze me! You are all so smart, talented, hardworking and sensitive, despite what life has thrown at you. What a great group; it's a pleasure to be connected to you. And in a wonderful and serendipitous fashion you represent the whole spectrum of the issue. Chris and Jen are anti anti-psychiatry, Juju sees value in both approaches and Karen has personally entered into reducing her medications, though very gradually, and is exploring the possibility of someday being medication free. And you know what? You are all right in your perspectives for your particular case. Chris is symptom free and considers herself recovered. She is one of the fortunate ones; the medications seem to have given her her life back. Jen went through years of hellish experience with her psychosis until she had a five month stay in a hospital where she began to take the medications for an extended period of time. Gradually she has gotten her life back too and is in the process of becoming a social worker so she can use her personal experience and know-how to help other people (which she already does in her mental health advocacy work). They both readily believe that it is the medication that has saved them and given them back the opportunity to have a full life. I really do believe that part of the reason for their personal successes is due to taking the medications, but I must point out to them and to all who read this blog, that they are overlooking one key ingredient: themselves. They are both ambitious women who are motivated by their desire to help others. They have both done a ton of research over time on mental illness, especially on schizophrenia and schizoaffective disorder. Because they live in populous areas, they've had access to quite a few mental health resources and being who they are, strong women who wanted to take care of themselves, they took full advantage of those resources. They not only took their medications faithfully, they got therapy, went to support groups, got vocational training and became serious advocates for mental health in the places they live and online. They are one kind of success story and if you are like them, ambitious and very hardworking, and if your biochemistry responds to the medications and if you have the resources near you, I think you have just as good a chance as they did of finding personal success. I have so much respect for both of them and I think they are doing the right things in their life. There is no doubt in my mind that they will go far in life and help a lot of people. But I'm starting to get the feeling that there are other success stories out there, success stories for people who don't respond to the medications or who are brave enough to attempt to reduce their medications, with the proper support. We need all the help we can get, and if there are alternatives to using the medications, my God, wouldn't you want that? Especially for those who don't respond to the medications? We are all the same and yet we are all different. We need to be pro-choice and never rule out the things we find that work for even the smallest percentage. A small percentage of people who currently have mental illness in the world is in the millions! Everybody must be welcome, everybody must be helped. I don't think it is wise to take too strong a position (though I might be trying to do just that--ha!) because a one-sided opinion is actually a weak position. To survive and thrive we have to be flexible, in mild winds or in hurricane winds. Polarization works at keeping things polarized and the only real outcome to that is civil war. And when that happens, people forget that we are all brothers and sisters on this planet. Does that sound corny? Well, I don't care because it's a big truth that too many of us ignore. So I've written about Chris and Jen's story and given my response. But what about Karen and Juju? Karen is also an ambitious woman and a strong woman, like Chris and Jen, and like them she is a writer, but she is also a visual artist. Her illness has restricted her for many years and she's learned to cope using both the medications, seeing a therapist and going to a support group (which she has also lead). She is very smart and insightful and very dedicated to her art work. Because she is so dedicated, it is important to her to be as sensitive, yet balanced, as possible. After reading several books that challenged the so-called "medical model" of the need to be medication compliant, she began to consider reducing her medications to see if she could become more sensitive in her life and with her work. In her system of priorities, being the best artist she can be is on the top of the list, even to the point of risking a return of symptoms. Some people might call her foolish, but I think she's brave. The main reason why I think she is brave and not foolish, is that she has a support system in place with her husband and therapist, with whom she is quite close. She also agreed to return to taking the medications if her symptoms returned enough to require hospitalization. And most importantly, in my opinion, she is staying vigilant to any and all changes, either for the better or the worse. So far, on a reduced dosage of her medications, she is feeling better and not worse, but if I know Karen, she does not take that for granted. She is no fool. She also just wants to be happy, just like all of us and she likes a good challenge. I, not only respect Karen, I identify with her because I am also a writer, an artist of sorts and a song writer. I know some of where she's coming from and I just think she has a fine and sensitive heart and mind. I want her to be very happy, which is why I want to be supportive of her decision to reduce and maybe eventually stop using the medications in conjunction with other alternative therapies (if possible). So far she's had some success and if that continues it can only be good news, not only for her, but for people like me who want to learn from what works out there. She's put herself in the frontier of people risking themselves to test out different approaches to their mental illnesses. I don't have her courage, not yet anyway, which is why I look up to her. I'm also way too ignorant and have a lot of research and studying to do, as well as feeling out what it is I want to do in my heart/mind. And if Karen's experiment doesn't work for her, I'm sure she will be creative in finding out what will. I know she can rely on her ability to be honest with herself. Either way, success or "failure", I'll be in her corner. She's the one who's really taking the risk here and she's not hurting anyone else in order to do it. And Juju? Juju is in the heartbreaking and sometimes maddening situation of being all she can be for her young son who suffers from schizophrenia. He's lived with the symptoms of this illness since I believe he was twelve years old and now he is eighteen. I only met Juju because she reached out to me and let me know about her blog which she just started in March. She strikes me as a real, smart mama lion trying to take care of her wounded cub. Her position is one of seeking any and all solutions or partial treatments to help her son. And what is she, too? A strong and ambitious woman who is also willing to go the distance for herself, her son, her family and her community. In the comments section of my last blog post, she gave the best advice: "Do what you need to do to be the best you you can be." Now that goes for anyone. My challenge to you now and always is to be super honest with yourself while at the same time being super kind to yourself. You don't have to be a superwoman or a superman, you just have to tell it like it is. Stop running. Study yourself. See what works and what doesn't work. Learn from your mistakes. Trust yourself. And if you're able to, and you know that you are, play fair with others, not just some of the time, aim for all of the time. If you do, gradually (or maybe even quickly for some) the world will change for the better. Guaranteed. Let's give peace a chance and lets use our hearts and minds together to find the solutions that are within reach, for all of us and not for just some. This is one of your best blog entries. I feel I need to reiterate that I was at a place I do not ever want to return to, and I will not risk that. My story might be unusual in that I received the right treatment within 24 hours. I wish only the best for you and Karen and Juju and Jen, as I do wish the best for everyone struggling with these kinds of challenges. What is the expression: All roads lead to Rome. If Rome is recovery, perhaps there are different roads to get there. (I traveled in Rome. You took your life in your hands crossing the street. The tour guide told us just to run out into the street and cross it or else you would not get to the other side if you hesitated. You are one of the sweetest, most intelligent people I know. Thank you for being so generous in describing your readers. It feels weird (but in a nice, luxurious way!) to have someone describe oneself in such supportive, sensitive, observant terms. Took two days off, but now I'm back on board working on a drawing that has positively obsessed me! I can't wait to finish it and share it with you. Be about a week or more before its done. Its a gift to the man who tried to set up the art show with the pharmaceutical's money. He said he learned a lot working with schizophrenic artists, and I wanted to give him a memento to remember us by. Last time I had so much fun, was when I was in my early thirties, on disability, and I was buying thrift store fur coats and ripping them up to sew fur pillows for Christmas presents! Is there anything in Buddhism that says that giving a gift is more fun than receiving one? Oh I believe, I do believe it is true! Occasionally on this project I pray that it turns out well. I've never prayed before for a drawing. But its rather sweet that I think my very soul is taking a risk. And of course the PhD I was working with has no idea what is coming his way. I've already selected a box big enough to fit the drawing, and when he gets it, I hope he doesn't think I've cut off my ear and sent it to him. You know why you got such interesting comments last blog post. Like moths to a flame, we all are attracted to your light. How we all care about you! I'm sorry it's taken me so long to write you back! I've also posted this response on my blog. I've also re-read old journal entries that I've found, and it helps me realize the state of mind I was in. I've also experienced pretty heavy psychotic episodes that at the time, I completely believed were really happening. Now, when I read over my journal entries from those times, I have more of an understanding of my psychosis. It's not easy, but I'm still keeping a journal and I continue to work on my memoir. I believe that I will be able to encourage other people with my writing. I've also found a lot of encouragement in my Buddhist practice with the SGI (a Buddhist lay organization dedicated to spreading the teachings of Nichiren Daishonin's Buddhism). I'd never heard that the Buddha was the 7th Buddha in the world, rather than the first. I don't know who the first 6 Buddhas were? From what I've read, the Buddha who attained enlightenment over 2,500 years ago in India was the historical Buddha. He actually attained enlightenment an unimaginably long time ago in the distant past, and was reborn at that time in India. In the SGI, Nichiren Daishonin (a 13th century Japanese priest) was the original Buddha. He taught the way through which all Buddhas attained enlightenment in the past, and the way through which all people can attain enlightenment in their lifetime. This path is called Nam-Myoho-Renge-Kyo or the Mystic Law. Check out my Art Blog!